There is a lot of work to be done in the conservation process aside from electrolysis. 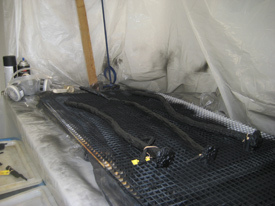 Immediately after an artifact is taken out of the electrolysis tank it is tested for chlorides, if any are detected then it is placed back into electrolysis. After we are sure the chlorides have been completely extracted, the item is placed in several different distilled water baths over the course of 1-2 weeks to leech the sodium carbonate out of the metal. 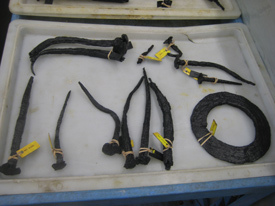 Following this the artifacts are dried either in the oven or with acetone, depending on the type of artifact. Wrought iron artifacts are bead blasted with glass beads, which do no damage the artifact, to remove any final corrosion. 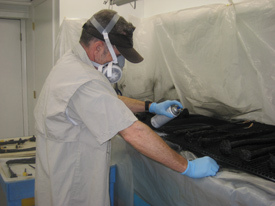 Then each artifact receives between 3 and 5 coats of a 5% tannic acid solution followed by 3-5 coats of krylon paint to protect it from moisture and humidity. 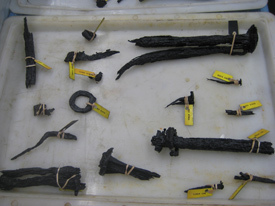 A post-conservation photo is then taken and the artifact is weighed. The database is updated with this additional information and then the artifact is put into air-conditioned, dehumidified storage until division. John wearing a mask to protect himself from the fumes. 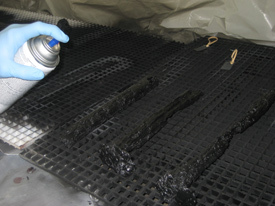 Large spikes being painted overtop a grate. Plastic is draped all around the artifacts that are being worked with. Spikes and Rings post- painting. 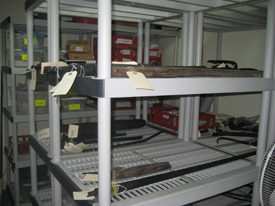 Artifacts in air-conditioned, dehumidified storage.